The Omega Speedmaster Spacemaster Z-33 is the revival of the classic pilot’s watch. Its modern design is rather a splendid combination between bold aesthetics and complex functions. This is definitely not an ordinary timepiece, but rather a very sophisticated and useful instrument that serves as a spectacular time keeping device for a large array of professionals. The Spacemaster Z-33 was inspired by the legendary “Omega Pilot’s Line” which introduced the Flightmaster in 1969. This model was developed, engineered and promoted for pilots who needed a two time zones watch on their missions. The striking design elements of the Flightmaster can be observed on the modern Spacemaster as well, but the contemporary model sports an upgraded look, a grade 5 Titanium case and a revolutionary multifunction quartz movement. Omega had another attempt of re-launching the pilot’s watch. This was in 1998 when it introduces the famed Omega X-33, a timepiece that was very much appreciated by Astronaut Chris Hadfield. The instrument was designed for experienced pilots and it came as a reply to the Breitling Aerospace. The experience and expertise that Omega cumulated when making the X-33 served as the basis for the revolutionary features available on the Z-33.The distinctive thing about the Omega X-33 and the Spacemaster Z-33 is that these space explorers are not self-winding mechanical movement pieces, but quartz operated ones. This very important detail allows the watch to provide multi-functionality and complex features that would never be possible on a mechanical device. For those with a passion for exploration and ground-breaking discoveries, the Omega Spacemaster Z-33 is a very suitable option. The model has a black LCD screen that features red segments and which is magnificently illuminated by the LED backlight that has the ability of automatically adapting its glow according to the environment’s luminosity. This means that the watch offers maximum legibility in every light ambient. The very bright and durable luminescent material that is present on the prominent minute and hour hands, and on the hour markers offer an impressive readability even during night time. According to Copycat Store, the Omega Spacemaster is a very innovative and complex watch that amazes both with its functional and technical details. The grade 5 Titanium case comes with a double wall case back. The reason for this particular construction is the fact that the case back fulfills two functions- the outer case back serves as a resonance chamber that amplifies the alarm sound whereas the inner case back offers water resistance to 30 meters/100 feet. From an aesthetic point of view, the case back has a matte surface and is engraved with an intensively polished Seahorse, the Omega logo and the “Speedmaster” word. The Spacemaster Z-33 stands tall and proud on the wrist thanks to its large range of available bands such as the brown leather strap, the black rubber strap with the red “Omega” and “Speedmaster” embossing and the grade 5 Titanium bracelet. The band is secured thanks to a foldover clasp that is stamped with Omega’s logo. The watch manages to impress every time with its functional highlights. The winding crown and the four pushers control the minute and seconds hands, the analog hour and the digital features bring extra utility to its wearer. 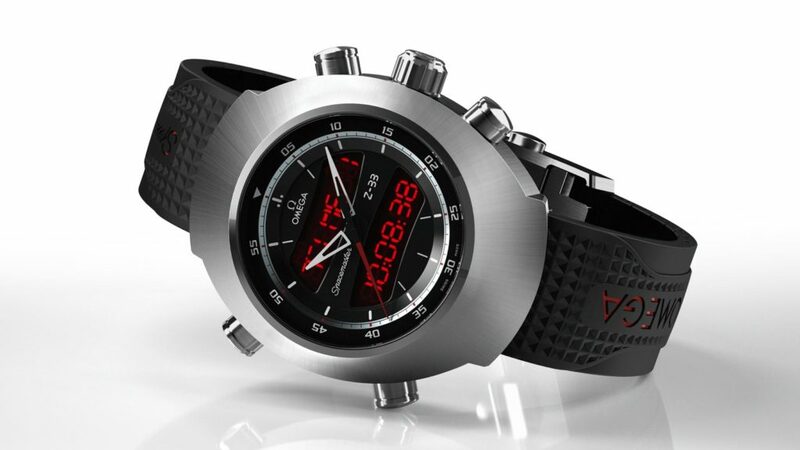 Plus, the model comes with a countdown timer and a chronograph function. There is a market of high end Omega timepiece where superior quality movements come to support extraordinary designs with a revolutionary twist. Their key attribute is utility. These watches can offer a degree of accuracy and functionality that isn’t possible on a mechanical model. Omega Spacemaster Z-33 is just that kind of timepiece. It has the best of both worlds. Its dial blends the appeal of an analog dial with the high performances of a digital display. Also, the futuristic and unique design contributes to its space explorer legacy.